SNL star Michael Che recently spoke to FSSA students. 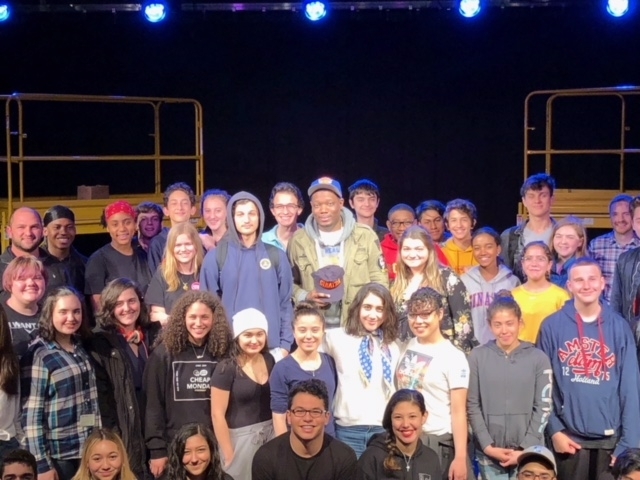 On Thursday April 27, the students at Frank Sinatra School of the Arts (FSSA) were delighted with a visit from Michael Che, the comedian and writer at Saturday Night Live (SNL) for the second installment of FSSA’s My Way speaker series. Embarking on his first international tour, Che spoke with hosts, FSSA Drama teacher Mr. Young and Film junior Natalie Martino, about the ride he has enjoyed in the business of comedy. Originally a visual arts major at LaGuardia School of the Arts in Manhattan, Che reminisced about his experience as a student in an artistic space. “Take advantage of this awesome space you have, not everyone gets this opportunity,” Che emphasized to an audience of aspirational artists. He reminisced on how making connections and getting acquainted with other artists of all crafts helped him throughout his career. When asked about his start on SNL, Che fondly mentioned his connection with fellow SNL writer and comedian Colin Jost. “Jost approached me and asked me ‘hey Michael, do you want to come to SNL and be a guest writer?,’ and I said yes,” Che recalled. A major subject Che touched upon was the art of comedy. “Comedy is all about listening,” Che highlighted. Che declared that comedy is not about being a jukebox, but rather a practice on utilizing your intuition to create a unanimous reaction from a group of people. “When you are able to get everyone to react in the same way at the same time, it’s like magic,” Che remarked. He certainly solidified that with every laugh that was shared in the room after every hilarious recount of his saturated life in comedy.